From its earliest days, perhaps back to Lotus Notes in the early 90s, collaboration has always promised a compelling value proposition. Working together online brought minds together, expedited the ideation and review process, and enabled others to more immediately benefit from the fruits of that joint effort. But collaboration has never fully lived up to it’s promise, except for academics and pundits who can wax at length about it’s (theoretical) virtues. The problem is that collaboration, as conceived in this context, is a purposeful and deliberate act. As if you would consciously allocate a certain percentage of your day to collaborative activities. We saw this in observing the use of Buzzword, which was one of the finer collaboration tools of recent experience. The problem was that you had to think to go to Buzzword to encounter changes or comments from your collaborators; there was no effective notification. Even if there were, Buzzword (and all of Acrobat.com) remained a place apart, separate from your ongoing work and attention. As a result, collaboration environments, as separate, discrete places disconnected from the flow of work, have remained somewhat stilted and their promise not fully realized. This is ironic when you think about it, and the opposite of the fluid and creative process evoked when you think of collaboration as experienced in jazz, improv or even flash mobs. Alas, online collaboration just hasn’t had flow. The sneaky thing about Convofy is that it looks familiar and innocent enough, something like Socialcast, Yammer or Chatter. It has a clean and orderly layout, a nice design, unique only that it is delivered in its own client application, not a browser, using Adobe AIR. The UI paradigm is now very recognizable, a social feed with an input control at the top. When you click in the input control, as with Facebook, a variety of options are available besides simple updates, including the ability to add files, links, notes, task lists, and milestones. So as you begin working in Convofy, you recognize it as a social networking environment, where you can add updates of various sorts, follow and be followed by friends and colleagues. You can also create groups, where you can segment your friends and colleagues. Oh, and you can also direct updates to colleagues and/or groups. So the social functionality is good, actually quite good, but the genre is well-understood by this time. Does the world need yet another one of these tools? Well, maybe, because Convofy goes beyond being merely social. The cross-over nature of this application becomes apparent when you share a file or even a simple note with a group or with specific colleagues. For many common file types, including Office docs, PDFs and most image formats, the document is uploaded and converted into a preview form for viewing in context. Followers with access can also download the file, but if you leave it in Convofy you will be able to witness the integration of social networking and collaboration. Convofy comes with an array of visual markup and annotation tools, the kind you will find in high-end tools like Acrobat and even Jive. These tools enable you to comment, highlight, underline, draw a circle around elements – all good collaboration capabilities when you want to work with others to create and refine content. Remarkably, you can even comment or markup web pages added as links. Yes, the link you add leads to a replica of the actual web page. The advantage of delivering the application in Adobe AIR is that Convofy can render the web page and make it available for collaboration. Marking up and collaborating on web pages seems like a potentially very useful capability – especially for web designers and developers – and a capability I haven’t seen since Equill was acquired by Microsoft. Finally, what makes this collaboration social is the fact that all comments and markups are surfaced in the relevant feed. In other words, the act of collaborative has become part of the social stream. Here’s an item snagged from a feed – a comment I made on a sentence taken from a Word document. The comment is above, and the snippet is a clickable link that takes you to the marked up version of the document. When you click on the new comment or markup, you get taken right to the referenced location in the document or image. The comments appear on the right (like Buzzword). 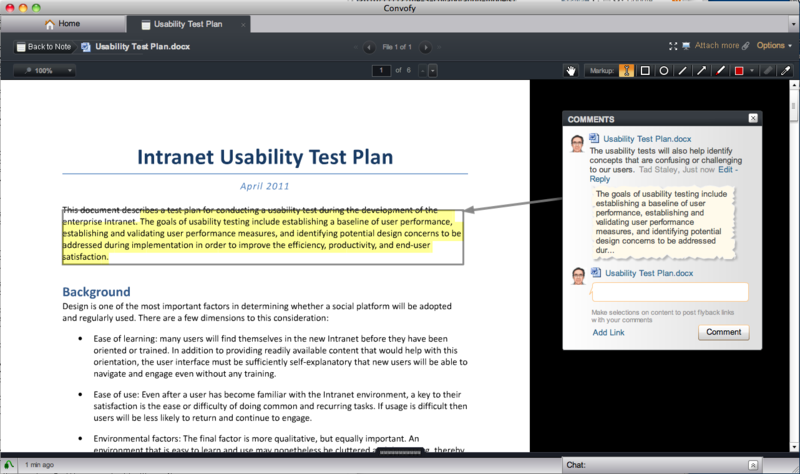 Convofy goes where Acrobat.com did not go, but should have, applying Buzzword’s commenting ability to a broader range of documents, including PDFs. So maybe this app will scale after all. It certainly is a fascinating attempt at uniting two related but heretofore only partially integrated application realms. With Convofy, the social element makes collaboration more immediate and relevant, while the collaboration capability makes social more substantive and valuable. This is an app worth watching.